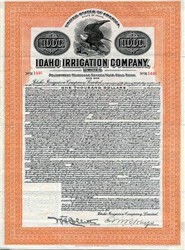 Beautifully engraved certificate from Idaho Irrigation Company issued in 1913. 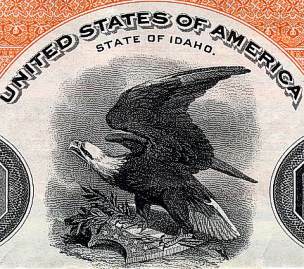 This historic document was printed by American Bank Note and has an ornate border around it with a vignette of an eagle perched on a shield with his wings opened. This item is hand signed by the Company's President and Secretary and is over 91 years old. The Idaho Irrigation Company, Limited, is a corporation organized as a construction company for the purpose of reclaiming lands under Carey Act, c. 301, 4, 28 Stat. 422 (Comp. St. 4685).